CodeChickenCore mod for Minecraft is an excellent and convenient modification that works as a main library for other great mods created by ChickenBones. 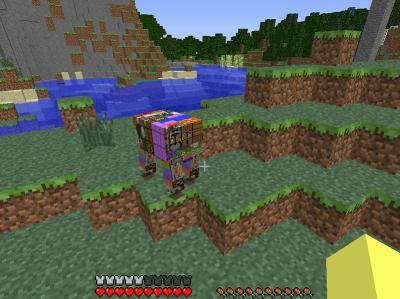 This includes such popular mods as: Not Enough Items, Ender Storage, ChickenChunks, and Wireless Redstone. So forget trying to manually install all these individual mods, this modifier does it all at once for you. ChickenBones is a well-known Minecraft modder. In addition to making his own mods, he has also taken a number of popular, but outdated and glitchy mods and fixed them up. He is especially well known for his regular updates and bug fixes. There is a reason they call Minecraft without mods “plain vanilla”, sure, it is fun, but also lacks a lot. Thankfully, it works very well with third-party mods, such as those by the user ChickenBones. There are a lot of fun mods by ChickenBones out there, but installing each one individually is a hassle and increases the likelihood of making a mistake and crashing your game. That is where the Codechickencore mod comes in. It takes all best ChickenBones mods and combines into one simple, easy-to-use package. Not Enough Items: This is the successor to the popular “Too Many Items” mod. It is a handy utility mod that works whenever inventory, or other such GUI, are opened. It then allows the player to easily view crafting recipes and item usage options. Unlike similar mods, which require sifting through lengthy crafting books, players can simply type item names into its search bar and then get related recipes. Ender Storage: This mod was actually made before the introduction of the EnderChest. Basically, it gives users a means to stores items at THE END of the game, basically allowing a universal and cross-dimensional storage network. Chests can be dyed, allowing for a simplified storage network across great distances. It also comes with EnderPouch, a mobile version of the chest, which can also be dyed. ChickenChunks: This introduces a new block called the “Chunk Loader”, which allows chunks to be loaded in memory at all times. It is very convenient to use as it comes with a special GUI for configuring chunk loading. Chunks are also free to load. Wireless Redstone: In this mod, a number of different items are introduced so that players can do exactly what the title suggests: use redstone wirelessly rather than having to lay down complex (and easily ruined) wire networks. New items include: wireless transmitter, wireless receiver, wireless jammer, wireless map, and much more.